It's time for one of our favorite annual events—Spaghetti 2016—and the Sprint Fort Bend County Landfill is a proud sponsor once again! 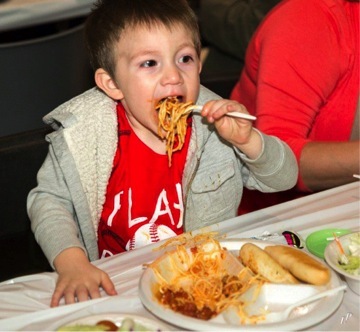 Spaghetti 2016 is from 5:30­­–8:30 p.m. Feb. 26 at the Fluor Corporation cafeteria in Sugar Land. The popular event sees law enforcement agents and firefighters compete in a spaghetti sauce cook-off, decked out in fun and festive costumes, to the entertainment and delight of all who gather for spaghetti, salad, bread and tea. The evening also includes live and silent auctions, a raffle with a $5,000 grand prize put up by sponsor Gallery Furniture, live entertainment, and a children’s activity zone that also includes games and prizes. This annual fundraiser supports an array of area nonprofit organizations, including Child Advocates of Fort Bend, the Fort Bend Women’s Center, Fort Bend Seniors Meals on Wheels, Texana Center for Autistic Children, Fort Bend Council on Substance Abuse, Crime Stoppers, YMCA, DePelchin Children’s Center, Literacy Council of Fort Bend and many others. Exchange is an all-volunteer national service organization working to make America a better place to live through one national project—the prevention of child abuse—and other community service projects. The Exchange Club of Sugar Land has put on this annual spaghetti dinner as its major fundraiser for almost 30 years. For more information about the Exchange Club of Sugar Land or to purchase tickets to Spaghetti 2016, click here.